Well, this was unexpected. Just when you thought Project X Zone had enough Mega Man reps, the latest issue of Famitsu brings word that Mega Man X4's Iris will join the game's already huge cast of characters. 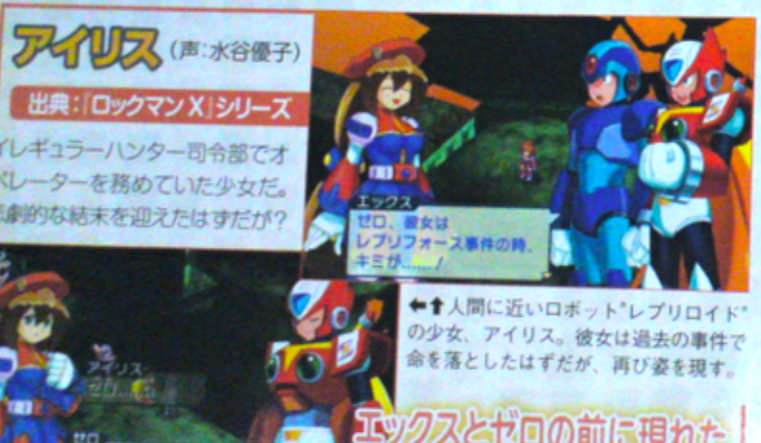 New characters confirmed in Famitsu also include Aura from the .hack series and Astaroth from Ghost ‘n Goblins. So... They just brought her back? THEN WHAT WAS HE FIGHTING FOR? I'm calling it now: the game will just overlook this little plot hole completely. They'll have a short converstaion and carry on with the game like nothing ever happened. This game is a little too big to concern itself with plot holes. O_O WIN..WIN..WIIIINNN!!!! I Love Iris <3 & it's the X4 design too! Dead or not, she is still great! "NO! THIS ISN'T HAPPENING! THERE'S NO REASON FOR ME TO GO ON! WHAT...WHAT AM I FIGHTING FOOOOOOOOOR!?" what is zero fighting for now? These kinds of games (like Super Robot Wars) are really fuzzy with their continuity and canon. The rule of thumb with Bamco crossovers are just know the characters and enjoy the scenario they're in now. Don't sweat the details like "shouldn't they be dead" or "does this occur RIGHT after X4? Or during?" Just a guess here, but I'd say Iris will buy the farm sometime during the game, but you'll get the chance to save her during a level. The neat thing about these games is that they generally give you the opportunity to save beloved characters that croak during the source material. Well now I wonder who else could potentially show up, but haven't been revealed yet. I now question if this is all the Megaman reps in the game. Astaroth was a villian in Namco x Capcom. If anyone gets where I'm coming from, then there is a high chance Juno could return. At the same time, I wonder if Volnutt and Sonic are actually there, but they are being kept quiet as a surprise. Aura from .hack in Project X Zone? what am I fighting fffffooooooooorrrrrrrrrrr?! NxC showcased the Gesellschaft and the Flutter as space fairing vehicles. By which I mean they introducing Tron, Roll, and Trigger into the game by crashing onto a moon in the year 20XX. In NxC they are premised as digging in ruins on extraterrestrial bodies all the time. They are stated to have already gone through the ordeal at Kattleox island despite the Gesellschaft being intact. Who are shown to be familiar in detail with the intergalactic criminal enterprise featured in the game. That they having a long history of assaulting other diggers on a series of other planets that seem to span the galaxy. MNV is right. You should in general expect the characters stories to be rewritten around the game's story. Rather than being 100% canon friendly with any of the series they're drawing from. She probably hid herself while she tried to repair herself. Actually, I think it would probably go more like this. Zero: Iris! You're...you're alive! But how!? Iris: I hid myself while I tried to repair myself. If Iris is in here, then I'm definitely hoping this comes stateside. For crossover games, just ignore canon. They don't follow canon. Although if X refers to her as the girl from the Repliforce incident, it could be referencing any point in X4. So maybe X and Zero were plucked from a point a bit after the opening battle of X4? My guess: they'll act like she didn't die in X4 but Zero will end up killing her anyway, bringing us back to some sort of status quo. Well, while they can just skip the canon implications of x4...it fun to speculate. One could also base this on if X's storyline in X4 was canon. He never ran into Iris near the end of the game. So its plausible that she either escaped or never went to the Final Weapon at all.